Casa Reasco comprises two vacation apartments for 4 persons each or more in the village of Torniella south-west of Siena and a 30 minute drive from bathing beaches. 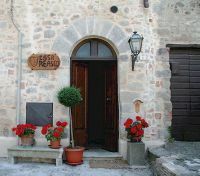 Here you can experience authentic Tuscany, as it was forty years ago. It is only 15 minutes drive to the ruined Abbey of San Galgano and the nearby Hermitage of Montesiepi with the famous sword embedded in stone, and Grosseto and the Maremma beaches are just 45 - 50 minutes away. The apartments of Casa Reasco may be rented together for larger groups and the pricing is highly competitive for these large and comfortable apartments. Click here for more information about Casa Reasco.